CHICAGO - Jan. 16, 2017 - PRLog -- January 17 will go down in the history books as the birthday of renowned Chicagoans Michelle Obama, Dwayne Wade and, yes, Al Capone. And now a new chapter is written. 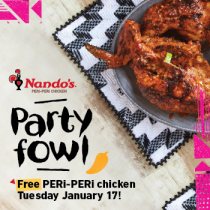 For Tuesday, January 17, will be the day Nando's PERi-PERi invites the University of Chicago to eat at Nando's new Hyde Park restaurant, for free. Nando's will officially open its doors in Hyde Park—at 1447 E. 53rd Street—on Saturday, January 14. Nando's will pay it forward that day by donating 100 percent of opening-day sales to the Kenwood Academy High School in Hyde Park, to help fund college visits for students at one of the best public schools in the city. WHERE: 1447 E. 53RD STREET, CHICAGO. RULES: DINE-IN ONLY. SEE TERMS BELOW. VALID UNIVERSITY OF CHICAGO ID MUST BE PRESENTED. The first Nando's restaurant opened its doors in 1987 in Johannesburg, South Africa. Since then, the Nando's flame has spread to 1,200 restaurants in 23 countries on five continents. Nando's is known worldwide for its succulent PERi-PERi chicken, marinated for 24 hours, flame-grilled to perfection, and basted to the customer's preferred flavor and spice. It's equally renowned for its spicy PERi-PERi, the Bird's Eye chili pepper that indigenous Africans introduced to the Portuguese centuries ago. Nando's PERi-PERi made its U.S. debut in 2008 with the opening of its first location in Washington, DC. Nando's PERi-PERi now operates three dozen restaurants in and around Chicago, Washington and Baltimore. For more information, please visit www.nandosperiperi.com, follow @NandosUSA on Twitter or Like Us at Nando's PERi-PERi USA on Facebook.